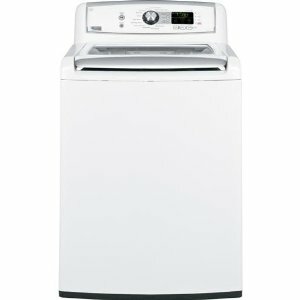 GE PTWN8050MWW Profile Harmony Series White Top-Load Washer 5.2 cu. ft. The PTWN8050MWW is a top load washer made available by GE for users who want a medium-sized machine with energy-saving features. This model is rated CEE Tier III and qualifies for an Energy Star ranking, which means it adheres to federal guidelines for energy efficiency, ensuring you of savings in both energy use and money. It features a unique TidalWave wash system which combines waves of water with mechanisms of infusion and centrifusion to aid in the flow of both water and detergent through the laundry, ensuring a gentle yet thorough manner of cleaning. HydroHeater with Sanitize option, which has a built-in water heater that increases the temperature of the water to be used in washing. The hot water, with an added Sanitize option, ensures you that all laundry in this washer will be thoroughly clean and free of common bacteria. Dispensing system: As for putting in implements like detergent to your laundry, the washer has a Flow-Thru Dispensing System which releases cleaning solution in the precise time during a cycle so that the machine’s performance will be optimized. The Speed Wash option allows you to quickly wash items that need minimal handling. The machine also has a My Cycles option that sets custom cycles depending on your specific load or frequency of using one cycle. The washer’s door, located at the top portion of the machine has a QuietClose glass lid with an extra-wide opening, which makes unloading and loading easier. The lid is opened and closed gently with a hydraulic tension mechanism, which won’t require you to exert any extra effort when operating the washer’s lid. Since the lid is also made of glass, it also allows you to peek inside the machine even when it is in use. The control panel of the machine is located in an overhead design at the top of the glass lid. Aside from the LED screen that informs you of the ongoing cycles and time remaining, you may also select the cycle you would like for a load through the panel’s rotary electronic dial. The cycles included in the washer fit specific loads, including Sanitize, Washable Wools, Speed Wash, Rinse and Spin, My Cycle, Soak and 2nd Rinse. Washer options and settings included for the model are Soak, Extra Rinse, Delay Start and Fabric Softener. The Timed Flow-Thru mechanism applies not just to detergent dispensing, but also to bleach and fabric softener dispensing as well. There are 5 available wash and rinse temperature options that you may choose from. There is only one custom cycle available for this model, as opposed to at least 3 in other popular washer models. The glass lid which serves as the main door of the model is not reversible. There is also no lint filter available in this machine.